The market’s power to fill gaps never ceases to amaze me. 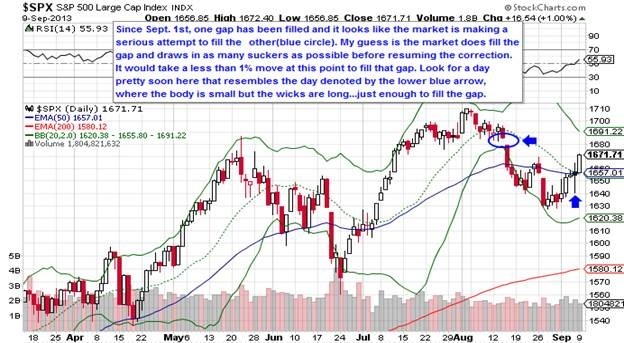 Gap-fill is a very tradable concept. Fair warning that I shouldn’t have to provide but will anyways, gaps don’t always fill so please don’t take the previous comment as some sort of end-all-be-all rhetoric on the ability of the market to “always” fill gaps. That being said, gaps do seem to get filled a fair amount of the time. 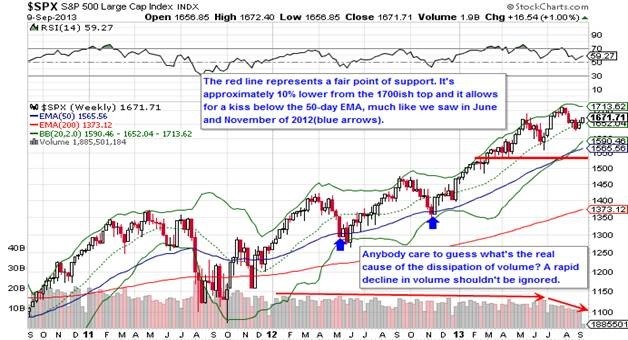 Now if we move down to the weekly chart of the S&P 500, we’ll see one potential ending point of this correction. 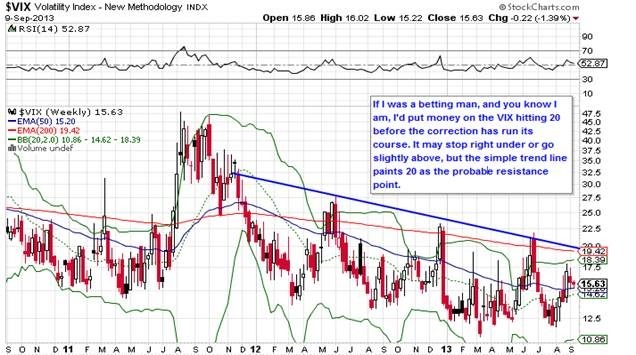 The VXX is the VIX equivalent so it tracks closely enough for a bet. 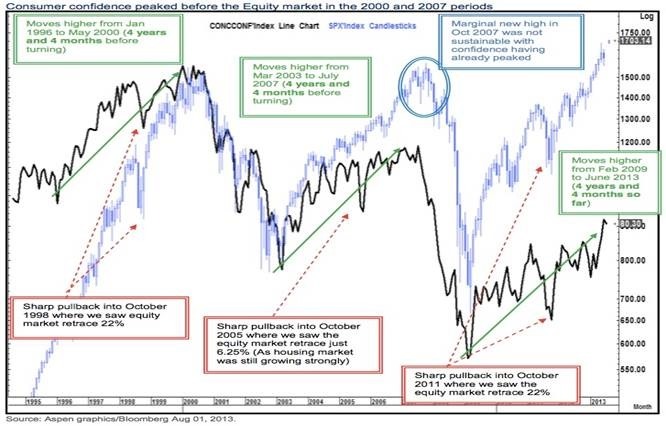 The following chart is from Tom Fitzpatrick & team at Citi and is decidedly un-low-rent. It examines the correlation of Consumer Confidence to the S&P 500 from 1995 to the present. It was posted at multiple sites I frequent but since I saw it first at KWN, I’ll hat-tip Mr. King. It looks fairly foreboding for the market similar to the Debt Margin chart I shared in the “correction stew” post. I’ll reiterate that I think if these charts(CCI & Debt Margin) are painting a picture of a serious down-move similar to 2000 and 2007, then they are very early. None the less, the chart tells a very interesting story. Recently, Vodaphone and Verizon completed the biggest M&A transaction in the markets since well Vodaphone and Mannessmann back in 2000. The chart below, courtesy of Zero Hedge, shows the market action of the S&P 500 subsequent to the 2000 mega deal, denoted by the first dotted red line. So obviously, this 2nd Vodafone deal signals the top and you better sell everything. Move your 401k’s, 403b’s, Keogh’s, and IRA’s to bonds and bond funds because the end is nigh. Get out of stocks because this M&A indicator has spoken. I love charts like this that can be interpreted in such an extreme way by the unsuspecting user. Are stocks a value at these prices? Do we have a multi-year run left in the stock market? Is it in the early stages of a big secular bull start like in 82? Nobody has any answers. Just continue to utilize sound strategies that fit within your investment/speculating comfort zone; and when visiting sites such as MarginRich, make sure to take any message with a gigantesco grano de sal and you’ll be okay.